5 March 1914: Entered the Army as a Fahnenjunker in the Feld-Artillerie-Regiment von Puecker (1. Schlesisches) Nr.6. 1 October 1934: Commander of the III. Battalion of Artillery Regiment 18 of the 18th Infantry Division. 20 February 1942: Artillery Commander (Arko) 7 of the XVII Army Corps on the Eastern Front. 17 February 1943-3 May 1943: Commander of the 72nd Infantry Division on the Eastern Front. 31 March 45 -17 May 1948: Prisoner of war in British captivity. 27 April 1945 transferred to Trent Park Camp 11 sorting camp. 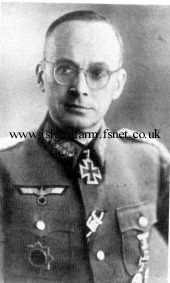 Knight’s Cross of the Iron Cross: 23 December 1943, Generalleutnant, Commander of the 299th Infantry Division. German Cross in Gold: 22 November 1941, Oberst, Commander of Artillery Regiment 252. Adair, Paul. Hitler’s Greatest Defeat: The Collapse of Army Group Center, June 1944. Arms and Armour Press, London, United Kingdom, 1994. Keilig, Wolf. Die Generale des Heeres. Podzun-Pallas Verlag, Friedberg, Germany, 1983. From 15 January 1944-13 March 1944, Generalleutnant Paul Reichelt commanded the 299th Infantry Division. Graf von Oriola’s duty status during this period remains unclear.